While Morocco’s community of start-ups and social entrepreneurs is relatively small when compared to many countries in the Middle East, there is a talented and driven nucleus of Moroccans set on changing this. Last week, Anou’s team was fortunate to be among many of these individuals at the Moroccan Social Enterprise Conference in Casablanca. Several weeks ago, Anou was asked to present at the conference and we were excited to take part. Keeping in line with Anou’s vision of ensuring that it is a platform made for and run by artisans, we always ask standout artisans who use Anou to present, rather than myself. This gives artisans the opportunity to be recognized for the work, and risk, they’ve undertaken as some of Anou’s early adopters. But presenting in front of over 100 people in a city an artisan has only heard of can be an intimidating experience. 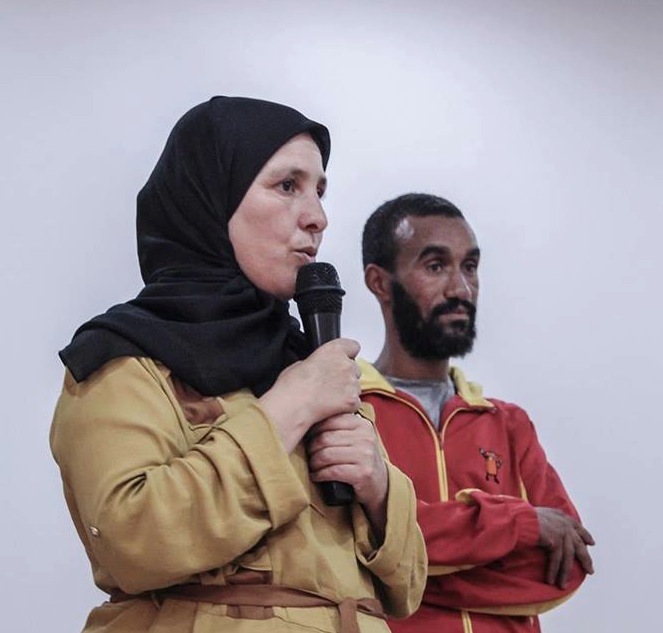 To prepare the artisans for this, we paired up artisan Mustapaha Chaouai (Association Nahda), who has never presented before, with artisan Rabha Akkaoui (Cooperative Chorouk), who has presented at a previous conference. We spent the evening before preparing the presentation and then we did a last minute run through an hour before Rabha and Mustapha’s slotted time. The goal of the extensive preparation is not only to ensure that artisans do a great job presenting, but also to provide the artisans with the opportunity learn the why behind Anou, rather than just the how. This in turn helps us build a community of artisans that believe and advocate for the vision that Anou represents. Anou has always been positively received at the conferences artisans have spoken at. Yet at this conference, Rabha and Mustapha started receiving applause halfway through their presentation and then received a standing ovation from the 100+ attendees when they concluded. Throughout the rest of the day, many attendees came up to Rabha and Mustapha to give them hugs and thank them for the inspiration to continue building their own start up or social enterprise. I have to admit that it was a little funny to observe the look of confusion on the face of Rabha and Mustapha as they were hugged – they felt that they had only given a presentation. What they slowly began to realize, however, is that they had struck a nerve in Morocco’s nascent start-up community. There are a lot of reasons why Morocco’s start up scene lags behind many other countries in the Middle East. Mehdi Reghai wrote an excellent article (sorry, it is only in French) that touches upon this and cites many reasons for this including: segregated geography, lack of research and development, poor infrastructure and crumbling education systems. Zak El Fassi, the first Moroccan-educated programmer to work at Google, believes that Morocco’s consumption economy has yet to evolve into a creation economy. From our personal experiences at Anou, we constantly feel an undercurrent in many of our conversations that Moroccans just don’t believe they are capable of achieving big things. None of these opinions are wrong. In fact, they all contribute to what makes Morocco what it is today. From the weavers in a rural village who wait for others to sell their work for them to the aspiring social entrepreneur with a big dream who is sidelined by the pessimism of his or her community, Morocco is often caught waiting for something to happen rather than actively pursuing its future. Mustapha and Rabha’s presentation struck a nerve because it challenged this very mindset. When artisans are able to innovate around infrastructure problems, perhaps the start up community may now perceive a lack of infrastructure as an asset rather than a hindrance. When an artisan with only a fourth grade education is capable of delivering one of the most powerful talks at a conference, then why can’t an ambitious university-educated Casablancan do the same, or even more? This is why Anou matters. 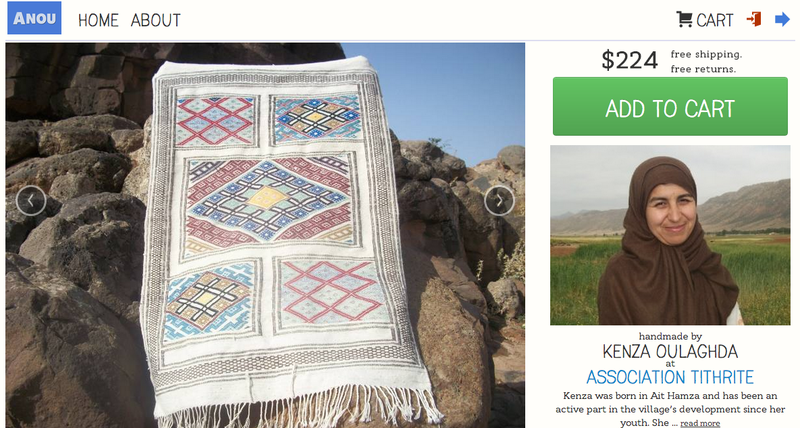 Yes, the easy-to-understand version of Anou is that it provides artisans a better wage than typical fair-trade. But a better wage is only the collateral of igniting the belief that yes, perhaps artisans themselves are capable of doing big things. This change in mindset is infectious beyond just artisans; this past weekend it spread to many members of Morocco’s start up community. Excitingly, Anou is only one thread of many that is contributing to the fabric of Morocco’s exciting future as a leading start-up community. Because of people like Adnane Addioui and Manal El Attir, who are inspiring Morocco’s youth to launch their own ventures through Fursa Challenge and Enactus, Kenza Lahou, who is building a community of entrepreneurs in Start Up Your Life, Zak El Fassi of JobFinder.ma, who’s raw coding talent demonstrates what Moroccan’s are capable of with lines of code, and even the late Karim Jazouani of the Nexties, who fostered a community of selfless collaboration in Morocco’s tech industry, it is clear that the Moroccan start-up community’s best days are ahead of it. Our team, and many artisans across Morocco, are excited to be a part of this bright future. 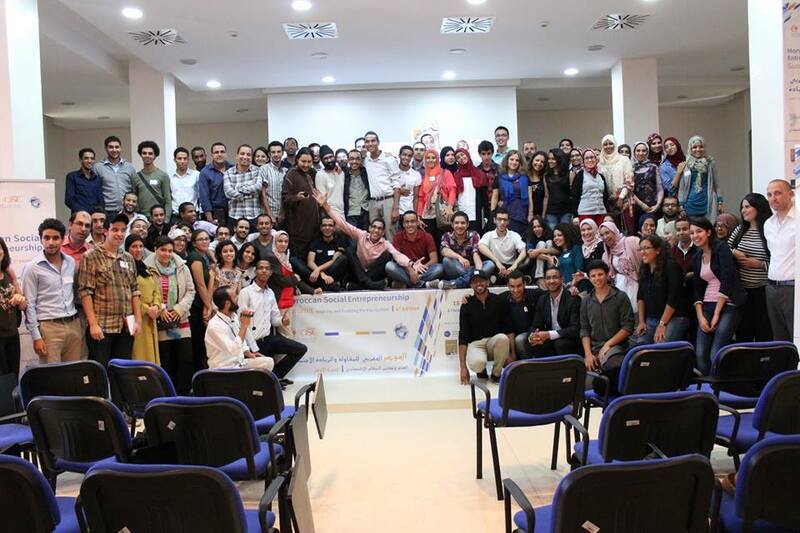 Participants at the Moroccan Social Enterprise Conference gather for a group shot at the end of the day. Looly’s Pearls: A female led cous-cous venture set on rebranding Morocco’s culinary traditions. JobFinder.ma: A Moroccan job search engine with regional aspirations. Stagaires.ma: A portal for Moroccan students to find internships. Clothes That Care: A buy one, give one online retail store. Start Up Your Life: A community of Moroccans committed to building Morocco’s start up scene. Moroccan Center for Innovation and Social Entrepreneurship: A platform committed to spurring social change in Morocco through innovation and entrepreneurship. Anarouz: A social enterprise committed to supporting female artisans. IT Pills: A electronic system that helps remind patients to take their medication. Started by two young entrepreneurs. Nexties: Morocco’s online tech magazine. In our trainings and follow up calls with artisans, we try and cover as many scenarios as possible related to their online business. Pricing, photography, sales, market demands, and packaging – the list goes on. No matter how intuitive we make the selling process for artisans, there will always be a lot of moving parts that they will need to master. We’ve noticed that for many artisans the gap between their current skill sets and what it takes to be successful on Anou shows how far some artisans need to go as they build up their 21st century business skill sets. Woven into our DNA at Anou is the belief that artisans will never gain mastery of such business skills through trainings alone. Instead, we believe that the only way artisans can gain mastery is to learn by doing. Accordingly, all the tools we build are centered on getting artisans directly connected to market as quickly as possible so they can learn directly from their successes, as well as their mistakes. We don’t expect artisans to be perfect from day one, but as they learn and grow with guidance, direct market access and real world experience, we know that they will become successful. It is no surprise then that when artisans first get started on Anou they make mistakes. But we view these mistakes as a good thing and we don’t shy from letting artisans make them. Yes, we could scale much more quickly, and we could generate a bit more revenue if we micromanaged artisans so they never make mistakes. But for Anou’s long-term success, artisans need to grow skills organically rather than having our team jump in and do everything for them. That is why you’ll see the occasional blurry photos or a few exorbitantly priced products listed on Anou. Yet some of the mistakes that artisans make can be a little bit more painful than blurry images. One mistake that has occurred several times is when an artisan forgets to remove a product from Anou if it sold in their shop or at a local craft fair. Even though artisans can easily remove products from Anou with a simple text message, every now and then they forget. Then when a customer buys a product on Anou that no longer exists, we have to return the customer’s payment and write an apology. This week, we had to return a $130 payment. Writing apologies with the hope that a customer ‘understands’ is never any fun. The customer contacted us understandably upset. Not only did they not get what they ordered, they felt fleeced by Anou and the cooperative thinking that we sold them knock off Chinese goods. When we followed up with the cooperative they were completely unaware that they had a ‘Made in China’ sticker on the packaging. They weren’t lying — we know the cooperative well. Not only has the cooperative worked with Peace Corps Volunteers for more than six years, we have verified that they are in fact the group that makes their products – they wouldn’t be on Anou otherwise. Moreover, the cooperative is just now getting online for the first time so it is safe to say they don’t have the experience to outsource their work to Chinese companies. When we reached out to the artisans we discovered that the actual reason behind the now infamous sticker was a bit less incriminating: the cooperative reused a bag that they just had lying around. As ridiculous as the situation is, damage has been done: Anou and the cooperative lost a loyal customer. It is safe to say that we’ll make sure we inform artisans in future trainings that it is prohibited to place anything resembling the words “Made in China” or any country other than Morocco on their products or packaging. Mark that as a lesson learned. Rabha, an Anou artisan trainer, paid a visit to one of the cooperatives on Anou last week. Her goal was to show the cooperative Anou’s new desktop and mobile platforms. Though she was told all the women would be ready, only half the cooperative was present when she arrived. Little did Rabha know that shortly after she scheduled her meeting the week before, the members of the cooperative had a huge argument. Apparently, a faction within the cooperative believed that the sales at a recent craft fair didn’t match up with the actual amount of product sold. Two members, tired of feeling that they were being shortchanged, quit working at the cooperative. The remaining members fought over who would attend the next craft fair. They eventually compromised and decided that two different members would attend the craft fair each day – even though cost of such a decision would certainly drain any profits the cooperative made. If there is anything I’ve learned after several years of working in Morocco it is that a lack of transparency begets rumors and frustration, which then evolves into a distrust that slowly erodes the effectiveness of institutions in Morocco. Small cooperatives, such as the one described above, are not immune to this. Almost every cooperative or association we meet possesses huge amounts of potential, but the members’ distrust in each other always holds the group back. This is the side of fair-trade that is overlooked. While fair-trade principles stress transparency, they rarely consider the transparency within the groups that fair-trade organizations works with. This is simply because many organizations do not work with artisans closely enough to know what is happening on an individual level. Organizations can transfer over the correct amount of money but after that, there isn’t much an organization can do in terms of transparency. How certain is the organization that their wire transfer will go to all the members of a group, and not just the president? Worse, how can they be sure their wire transfer didn’t just blow up a cooperative already paralyzed with distrust? Existing models of fair trade can’t answer these questions – it isn’t financially feasible for organizations to follow up with such detail. At Anou, we’ve built a system that creates transparency rather than treating it as just another buzzword. When an item is purchased on Anou and shipped, the artisans’ payment is sent immediately into their local bank account. Anou sends a text message to the artisan group president or confirming the amount that has been deposited, along with the transfer reference number. We also send an e-mail and MMS with a copy of the transfer receipt. If the payment amount in the text is different than what is posted in the artisan’s account, we tell the artisans to call us directly so we can investigate the discrepancy. However, we quickly realized this wasn’t enough, as it still didn’t address the transparency within the association or cooperative itself. When groups are fighting, they don’t post items on Anou, they neglect the shipment of products, or worse, they stop making products and close up shop. Every artisan that is tagged into creating an item will now be notified not only of when their product sells, but also the price. This past week, we released a new tool that will finally address this. Now when an item sells, not only will the cooperative or association president be notified of the item that sold, but so will any artisan that helped contribute to making the item. In the text message sent to a contributing artisan, it will show the product ID number as well as the price that the item sold for. This way, every member that contributed to a product will know exactly how much it sold for. In line with Mohammed Yunis’ model of micro-finance, artisans will be empowered to hold each other accountable in a space of full transparency. To bolster the effectiveness of this, Anou will periodically call up artisans to ensure that they were paid the amount that they were owed. If we notice a problem, we can simply decide to suspend an artisan’s account on Anou until the issue is resolved. At the end of Rabha’s meeting with the fractured cooperative, Rabha reviewed this new exciting tool that would help create transparency within the group. The cooperative’s members were incredibly excited about the idea and couldn’t wait to use it. The most excited member? The embattled president who felt that with Anou she would be able to gain the full trust of her team and reach the cooperative’s full potential.